In the following guide, we aim to answer that question by offering an in-depth review of the best camping chairs currently on the market and a detailed analysis of what goes into the making of the ideal chair for every type of adventure. Let’s start off with our top picks of the best outdoor chairs per category for 2019. What To Consider When Buying A Camping Chair? Available in a variety of different colors. Simple to setup and breakdown. Strong build, will support up to 320lbs. The mesh prevents pooling of water. Not well suited for tall people. The Helinox Chair One is a super lightweight, very comfortable and stylish, compact camping chair that packs up smaller than a Sunday paper. The poles are made of aluminum alloy, a proprietary product, which ensures maximum strength with minimum weight. The removable seat and carrying case are made from durable, 600-weave rip-stop polyester and is machine-washable. Setup is quick and easy with a single internal bungee cord that self assembles the aluminum poles. Ideal for camping, concerts and other outdoor adventures events. The Helinox Chair One comes in a variety of colors and has a manufacturer’s five-year warranty. We would highly recommend sitting in this chair to ensure fit. The great news is Helinox makes the same style of camping chair in a variety of sizes: the zero, the two, and a large for example. None- simple design with no frills. Coleman is a well-respected brand. The side table with integrated cup holder provides easy access to food and beverages. Comfortable seat with padded arms. The carrying handles make for easy transport. Does not fold up very small. The frame is aluminum not steel. Can only support up to 225 pounds. 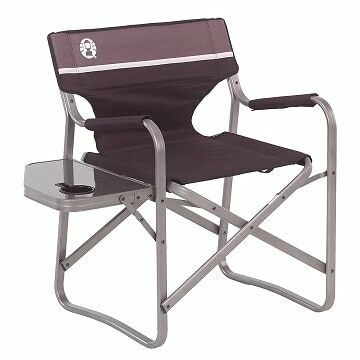 Bring a relaxing treasure with you to the campsite, barbeque, or even your deck with this Coleman camping chair. 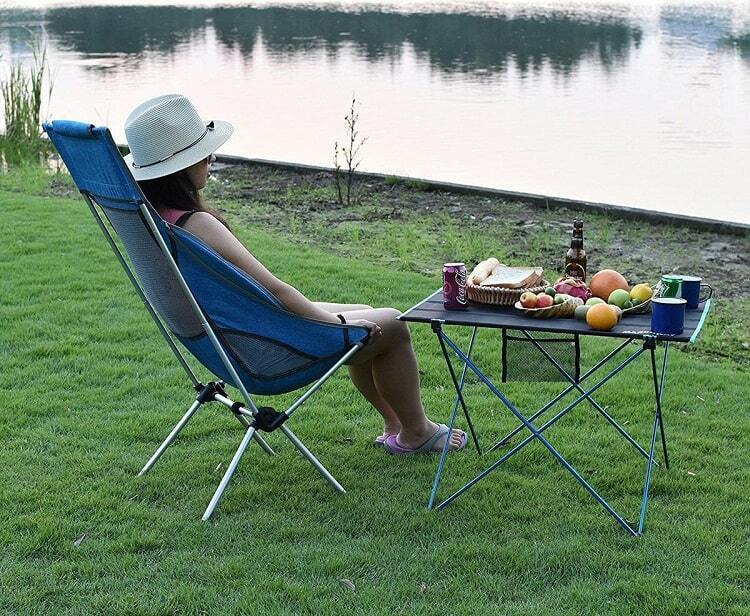 Ideally designed for the outdoors and camping, this folding chair keeps food, liquid refreshments, and personal bits and pieces within reach thanks to a convenient side table and integrated cup holder. The frame is constructed of aluminum, making it really light yet sturdy. The cushions are made from weather-resistant fabric. The cushion has just the right amount of fluff without being bulky. This Coleman chair is tremendously comfortable and provides plenty of support when reclining. The folding side table is very stable, and is solid enough to support beverage cans and plates of food, even heavy ones. All in all, it is a lightweight, ergonomically designed chair that provides superior comfort. Padded back, padded seat, padded armrest. Sewn-in carry straps for easy transport. Easy to open and set up. Fully padded seat and arms. Ergonomic design creates a relief for back issues. Maximum load capacity of 300 pounds. Oversized seating provides extra comfort for long-time use. On the heavy side at 13 pounds. Does not recline and has a pretty straight back. Only comes in two colors- black/blue and camo. Timber Ridge had comfort in mind when designing this chair. This is the go to chair for those with back problems or any mobility difficulties. Because the seat sits higher than in other chairs, you can utilize the padded steel chair arms, to rise out of the chair with ease. With a load capacity of 300 plus pounds you’ll never have to be concerned about the chair faltering. The ergonomic design, padded armrest, high back and heavy duty steel frame makes it very durable without sacrificing comfort. It also includes a swivel cup holder on side the of the chair to hold your beverage, hot or cold. It can be folded up easily and slid into the carrying bag that is included. The bag has a handle large enough that you can slip over your shoulder for easy transport. A swivel cup holder on the side of the chair. Padded seat, back and arms. Quick set up even with all attachments. Very secure and won’t break or collapse. Large table surface makes room multiple beverages. OH yeah…. The cooler is awesome. Not the best option for portability. Comes in one color: black. If you are a bigger guy looking for something sturdy and yet comfortable this bad boy is the choice for you. 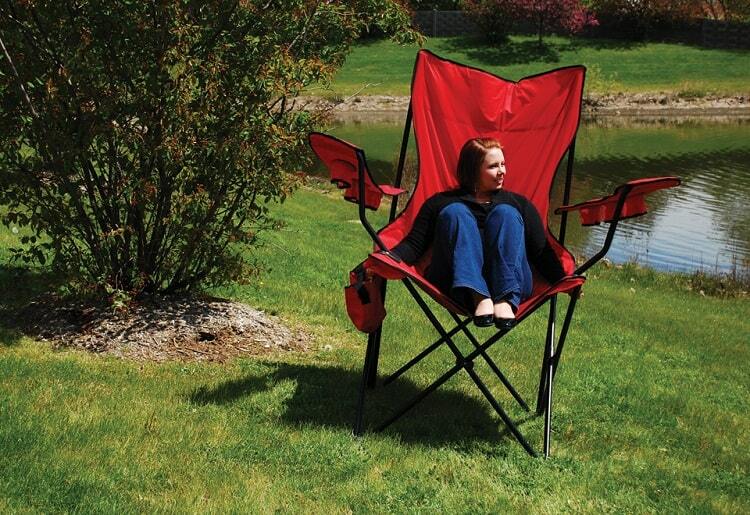 When it comes to larger folks, most camp chairs seem flimsy when you sit in them. But the KingCamp is very stable and well built. With the KingCamp chair you won’t have to worry about falling, or feeling precarious when you should be comfortable, and that’s well worth every penny you’ll spend on this chair. Breathable, moisture-wicking fabric seat and back, padded armrests to add more comfort, combined with a frame built like a tank and you get a chair that will last a long time. This chair has some great extras too. Our favorites are the side table and a built-in cooler (that holds eight 12 oz cans!). It’s easy to relax at the end of the day in this chair. Just grab a snack and a beverage, and you’re good! Height: From surface of the seat to the highest of the back 20.9 inches. Material: Breathable, moisture-wicking poly fabric and steel frame. Side table provides extra space for personal items. A cup holder built in. Attachable umbrella option (sold separately). 2 second set up and pack up time. Reinforced throughout with 600D Rip Stop Poly. Easily transportable for longer distances. Not the most comfortable chair. Want a comfortable place to sit around the fire without bringing a 13-pound chair? This is a great chair despite its small size. It takes up almost no space and is pretty comfortable, considering it is a tiny tripod. And if you’ve trekked into the back country, you deserve a comfortable place to sit. This little guy packs small and weighs only 2lb, which is perfect for back country camping or fishing. The Slacker takes only a couple seconds to set up and holds an incredible 275 pounds. Collapse it, wrap the hook-and-loop strap around it, and you’re ready to bug out. Comes in 4 colors currently– Red, Black, Blue and Green. Superbly built chair designed to last. Large seat, cup holders and extra storage. On the heavy side at almost 13lbs. Seat tends to sag overtime. Sitting for longer periods get uncomfortable on legs. This is definitely a beast and is a great chair for taller/larger individuals. It’s extremely roomy, the material is comfortable, and it’s very easy to move around in. The King Chair remains the strongest (holds up to 800lbs), most reliable and durable quad chair you can find. Even if you’re a smaller person who doesn’t need the extra weight capacity, the comfort and strength that you’ll gain from this chair is unmatched by any other chair on the market. This chair even folds up compactly, fits in a carry bag, and can be easily carried with on all your camping trips. It comes with 2 drink holders, 2 pockets on the side of the arms, and another pocket on the back. It folds up quickly and without much hassle. This chair has plenty of room for obliging larger individuals, especially when getting in and out of the chair. Unfortunately, that same roominess can also cause some discomfort if you sit for long periods. Includes convenient shoulder carry bag. Each adjustable armrest comes with a cup holder. ALPS Mountaineering Eclipse Table (sold separately). Sport-Brella Umbrella with Universal Clamp (sold separately). Comes in three colors: Deep Sea, Salsa or Khaki. Which is the best camping chair for you? Do you want a side table attached? Or are you just looking for a comfortable option that is also affordable. Let’s delve a bit deeper into the core elements. There are a host of options when it comes to chair material. Canvas and a heavy rip-stop type polyester are typical options. Both are durable and easy to clean, but polyester can be questionable next to the campfire. Lighter weight chairs may have a combination of mesh and canvas, to help reduce weight. When it comes to the skeleton of your chair you’ll see two options aluminum or a light-weight steel. If you are planning on setting your chair by a fire and not moving it, you are great with steel Portable chairs should have an aluminum frame. Size matters, not only the size of the chair but the size of you. If you are over 6’3 or over 250lbs your options get more limited. What about if you’re under 5 feet or under 100lbs? Another aspect to consider is how and/or where you plan to use your chair. Will it reside in your camping gear or do you plan to utilize at picnics or cookouts when not camping. Weight can be a factor if you plan to camp in windy locations or if you might decide to carry it further away from camp to set up. A weighty chair is not as dangerous if it’s gusty but a disadvantage if movability is a prime attribute. If you plan to sit for any period of time, comfort will be on the top of your list of features. Nobody wants to recover after a long day of camping activities, in an uncomfortable chair. Do you want a padded seat or padded back? Do you like to put your feet up? These are all important comfort questions you need to ask. Each camping chair we tested fit very differently, making us feel a bit like Goldilocks! Some were too small, others were way too big! Some had a foot rest, some had tables, and some had no arm rests. Comfort is very individualized, depending on your size and build. We suggest trying out some chairs, and finding what feels best for you, and which chair will improve your napping comfort! Can you easily carry the chair to and from campsite? Not all chairs have built in handles, some do. Consider the weight of the chair in its bag and compare that against how far you need to lug the thing. Chairs with tables attached need to fold out of the way for easier transport. If you need a super portable chair, you may need to skimp on the extras. How many trips will your camping chair survive, is a serious factor to think about when you are doing research. Is the chair built rock-solid? Does it have pieces that can easily be replaced? If you don’t wish to purchase a new camping chair every couple of seasons, consider investing in a solid well-made chair that will withstand all the cruelties you and your camp mates will dish out. Desired features can be another key determining factor when hunting for the perfect new camp chair. Side tables that fold down, foot rests to kick your boots up on, and a spot to hold your frosty beverage are some of the more deluxe features of today’s camp chairs. Some other handy features include pockets for books, stowaway compartments to keep gear and snacks dry, and some camp chairs even come complete with an umbrella. Other basic factors to consider when selecting your new camping chair include: how often it will be used, ease of setup by others, weather conditions and environments you plan on exposing the chair to, and the desire to kick back and take a siesta if you wish. Your camp chair can actually be a very handy accessory to bring with on your next fishing trip. Depending on the style of fishing you do, whether its ice fishing or fly fishing, your camp chair is perfect for your fishing adventure. Most camp chairs have cup holders, and fabric seats, backs and arms. These two features make your fishing adventure more comfortable. There’s nothing nicer than keeping a bottle of water or your favorite beverage close at hand while you are fishing. The cup holder can be used to hold fishing necessities like bobbers, line, hooks and containers of bait. Just make sure you empty your chair of fishing gear, before you pack up for the day. A forgotten hook can result in a painful trip to the doctor. For those that enjoy a trek off the beaten path for a fishing adventure, a camp chair is the perfect way to have a bit of comfort and “luxury” while fishing. They are highly portable, lightweight and often come with a strap for easy carrying. You shouldn’t have to find a rock or uncomfortable log to sit on, if you invest in a portable camp chair for your next fishing adventure. Other Uses for Your Camp Chair? Yes, it may be called a camp chair, but that doesn’t mean that you can only use it while camping. Sporting activities – You don’t have to sit on the grass when you’re watching the kiddos play sports, bring your camp chair, and be comfortable! Picnics and BBQs – If you are planning a day at the park or at a friend’s house for a fun barbeque or picnic, don’t forget the camp chairs. You never know if there will be enough places to sit, so bring your own! Tailgating – If you love to tailgate on game day, don’t forget your chair. Not only will you have a place to comfortably enjoy the pre-game activities, but you’ll also have a place to set your beverage. A day at the beach – If you don’t love to sit on hot sand, or would rather dry off from swimming without being covered in sand, bring your camp chair. Extra chairs for visitors – Maybe you’re hosting the barbeque and need more seats. Pull out your camp chairs to give extra seating for your guests. How to Clean a Moldy Camp Chair? This may seem like a strange topic to include, but believe it or not, camp chairs can get gross. We’ve all experienced that really rainy camping trip, where everything ends up soaked through and covered in mud. And, if you don’t promptly set everything out to dry, you end up with moldy, mildew covered chairs, tents and gear. Don’t fret about this though, cleaning up your favorite camp chair is relatively easy. 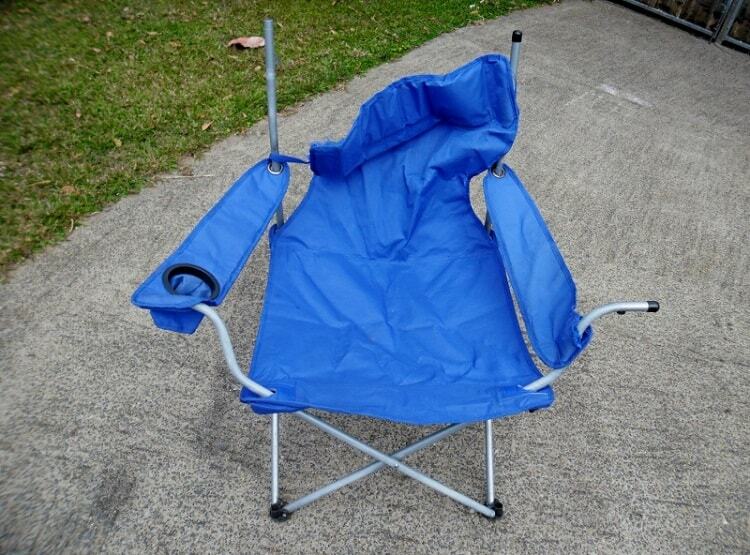 The first step to getting mold or mildew out of your favorite camping chair is to let it dry in the sun. Sun is a great tool for knocking back mold and mildew. Once your chair is dry, you can start to process of removing the mold, mildew and dirt. The easiest way to do this is to use a steam cleaner. The heat from hot water will pull out dirt and kill mold and mildew. However, not everyone has a steam cleaner, so your other option is to roll up your sleeves and hand wash your chairs. Use a scrubbing sponge and warm water with a mixture of a mild soap (dish soap or laundry detergent work well), vinegar, lemon juice and a touch of baking soda. This mixture will work to kill the mold and get out all of the dirt. For easy application put the mixture in a spray bottle, and you can easily clean your whole chair or just spots. Then, don’t forget to let the chair dry thoroughly in the sun. How To Repair A broken Camping chair? If you have a camp chair that you love, or just a new camp chair that hasn’t been used much, it can be a bummer if it breaks. You may not want to run out and buy a new chair. So, you have to figure out how to repair the chair so that it is sturdy and will last a few more camping trips. If you’ve torn the back or seat at the seam or if a seam has come undone, the simple repair is to sew the seam back up. This repair is relatively inexpensive, but if you aren’t comfortable with thread and a needle, it make take a couple of tries. Because most camp chairs are made of a heavy canvas material, you will want to buy heavy-duty thread, preferably thread made for outdoor applications, and a thick needle. If your chair has a hole not at a seam, the easiest way to repair this damage is with a patch. We’ve found that the simplest way to cover a hole in the seat or back of your camp chair is to add a patch. If you’re comfortable with sewing you can sew on a homemade patch of canvas or denim. If you aren’t as comfortable sewing, pick up an iron-on patch at your local craft store or even Wal-Mart. The other common repair need is replacing a lost pin. Folding camp chairs often loose the pins that hold the legs together. An easy solution to this, is to find a small bolt and nut that will fit in the existing hole. Simply push the bolt through the holes and tighten the nut at the back. If you can’t find a bolt that fits the existing hole, you may need to use a drill to make the hole bigger. Just remember, opening and closing the chair can loosen the nut, so check the nut frequently to ensure that your chair doesn’t randomly collapse! We understand that a camping chair is not the most exiting piece of gear to research, but trust us, a good camp chair makes for a much more comfortable experience. Our goal was to find the camp chair that matched the portability and durability of the rest of our other camping equipment. However, we also wanted a chair to meet comfort standards without being too complex to use or take up too much space. Happily, we were able to test some outstanding products that surpassed our expectations and elevated our opinion of camping chairs. We did all of this to help you find the best camp chair to fit your needs. We want to hear about what products our customers are choosing and why, so let us know, in the comments below, which camping chair you chose for your next outing.